Intent - Cougar depicts a closeup of a cougar. 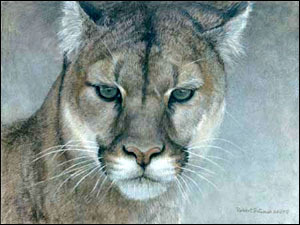 Intent - Cougar copyright© 2007 by Robert Bateman is prohibited from being copied. All applicable copyright© laws apply and are reserved by Robert Bateman. Robert Bateman art, intent cougar, wildlife paintings, cougar, art work, canvases, images, paintings, pictures, and prints of Intent - Cougar by artist Robert Bateman for sale. Intent - Cougar painting by wildlife artist Robert Bateman can be purchased in art print or canvas form at special sale prices at Christ-Centered Art.